This invention is of a convertible stroller. A compact, convertable stroller. As a parent we all have been at a place where we have too many things packed in one stroller every time we step out of our homes. Even if we take our little ones on a short trip, as parents, uncles, aunts, grandparents, we still need to carry, baby bags, stroller, toys, diaper bags, you name it. and then all of that has to be either on our shoulders, backpacks or under the tight stroller areas . And if that is not enough we still have to offload all that stuff under and over the stroller when putting the stroller in the trunk of the car and then reload it once we are at the destination!! well my invention is a simple and most effective solution to deal with all the clutter. It allows the parents or user to be totally handsfree, while the baby is in the stroller and once the baby is out. The stroller in its open or closed position will keep everything secured and in its place, on the road or in the trunk of your car. Once the baby is out of the stroller the stroller becomes a neat cool looking suitcase / bag carrier that hold all your baby essentials in one place. it can go through the airports like a suitcase without the fear of any damage. it can go in the trunk of your car without taking any major space and once the stroller is opened the seat pops up for the child to sit just like a regular stroller. All essential stuff needed for the baby never has to be offloaded or reloaded. It is truly a hands free and a great comfortable experience for the kids as well as the parents. there is no such product in the market! There is also an utility patent pending on the same. at this time i am looking to sell or do license the invention. this kind of product is never been in the market whatsoever. the potential of this invention is for anyone who has a family as parents, grandparents, uncles, aunts, grandparents, gifts. etc. it also has built in entertainment for the child, which will help them relax. it is a multipurpose convertible stroller. 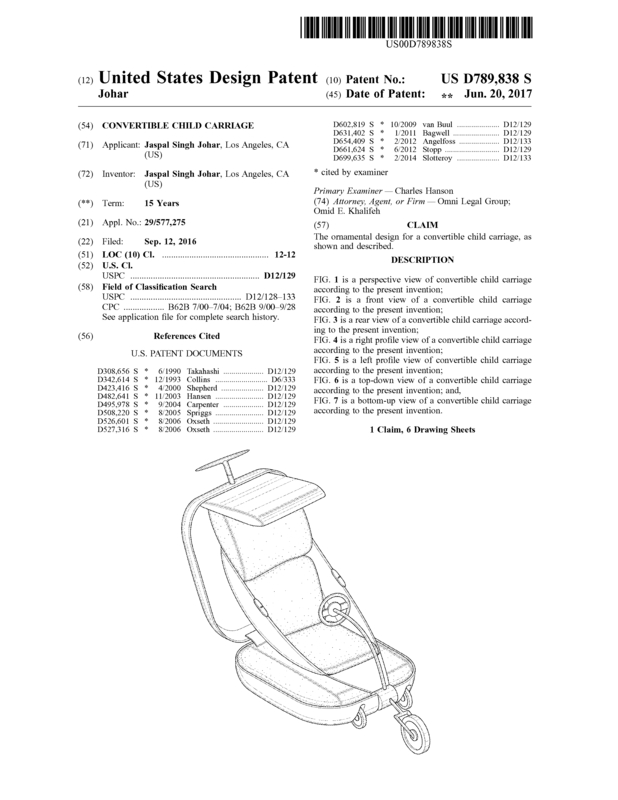 Page created at 2019-04-23 6:09:56, Patent Auction Time.